This fun and exciting safari adventure in Kenya will take you to Maasai Mara National Reserve, Lake Nakuru National Park, Lake Naivasha National Park, and even a visit to the famous Hell's Gate. Witness the big five, the wildebeest migration from July to October, and be amazed at the variety of animals and beautiful scenery. Come and join now! For this safari tour, you will be provided with four nights accommodation. On your first and second night, you will be staying at Lenchada Tourist Camp. It is a budget safari camp just outside the gates of the Masai Mara Game Reserve and regarded as one of the wildlife jewels in Kenya. The camp is built with all the comforts of home, including solar-heated showers, bed with pillows, sheets, blankets, and mosquito nets. Additionally, as a backup, a standby generator that supplies lights and refrigeration for the dining area allows cell phones and digital cameras to be recharged. The camp is surrounded by a natural environment, waking up to bird twittering and roaring of lions, hyena’s monkeys drama in the bush around. The camp charms guests with its warm welcome and rests along a stream valley overlooking picturesque hills and rolling plains of Oloolaimutia in Mara National Game Reserve. On your third night, you will stay and relax at Lanet Matfam Resort which is situated in Nakuru East, approximately 10 kilometers from Nakuru city center. The resort prides itself on offering guests comfort and quality accommodation, be it for a short or long term stays. The resort is ideal for business travelers and those individuals looking for a tranquil retreat. There are 14 rooms of which, nine are double rooms and five are single rooms. These rooms are designed for comfort and offer en-suite bathrooms. There is lounge and dining area and the well-manicured garden feature a children’s play area as well as a lapa. Nakuru offers many attractions such as the Lake Nakuru National Park, Lake Naivasha, Hell's Gate National Park and Menengai Crater, a must for any visitor to the area. On your fourth or last night you will stay at Taphe Guest Resort. It is conveniently located near major tourist attraction sites in Naivasha including Lake Naivasha, Hell’s Gate National Park, Longonot National Park, and Mount Longonot. Taphe Guest Resort rooms include single, double, twin, triple, and executive rooms. The executive room is very spacious and beautiful with large windows overlooking Lake Naivasha. You will depart in the morning initially heading north from Nairobi and stopping for magnificent views over the Great Rift Valley. You will then begin to travel west over the escarpment and drive along the floor of the Rift Valley to Masai town of Narok. After a stop for lunch, you will proceed to the Masai Mara Game Reserve with game viewing en route to the overnight camp. The Masai Mara is not fenced and that you can look out for animals not long after departing Narok. The Masai Mara Conservancy supports extensive wildlife and is a migration corridor to other parks and reserves. Enjoy a full-day game viewing with picnic lunch on the Mara River overlooking the hippo pools and the Serengeti. One of Kenya’s premier reserves, the Masai Mara is an extension of the Serengeti and world-famous for the spectacular migration of thousands of wildebeest and zebra during the months of July and October. The Mara is also rich in resident game with over 95 species recorded. These include the big five - elephant, buffalo, lion, leopard, and rhino - as well as giraffe, cheetah, hyena, hippo, and numerous species of antelope. The reserve is also rich in birdlife with over 480 species recorded in recent times. You will return to camp for dinner and overnight stay. If you are visiting during the migration period and wish to view the amazing spectacle more extensively, Gracepatt Ecotours Kenya would suggest adding an extra day in the Masai Mara. After breakfast, you will undertake a short morning game drive or you have the option of taking a walk with the Moran to visit a local manyatta and learn a little about the life of a nomadic pastoralist. Then depart the Mara and proceed via Narok to the Rift Valley town of Nakuru, where you will arrive late afternoon. Overnight and dinner at the camp or hotel close to Nakuru. After breakfast, you will enter Lake Nakuru National Park, which is famous for the thousands of flamingo that inhabit the shores of the lake. In recent times, the water level of the lake has fluctuated greatly and this has affected the numbers of resident flamingos. Although perhaps most importantly, the reserve has been established as a rhino sanctuary, and black and white rhino are frequently seen on game drives, along with buffalo, lion, giraffe, waterbuck, and the elusive leopard. You will have a picnic lunch in the park, then, at mid-afternoon, you will depart for Lake Naivasha. Arrive at the gate of Hell's Gate around mid-morning, start biking tour for two hours within Hell's Gate, some people will opt to drive which is also allowed. Animals that can be seen there include bushbucks, dikdiks, giraffes, gazelles, gnus, hartebeests, impalas, klipspringers, buffaloes, hyraxes, zebras, hyenas, jackals, mongooses, baboons, monkeys, and porcupines amongst others. The park has historically been an important home for the rare lammergeyer vultures. From 11:00 a.m., visit the gorges for one hour, capture beautiful panoramas of the gorge's small thin depressions of land mass where you can walk underneath. Around 12:00 p.m., you will return the bike at the gate. Then you will start your way to visit the Maasai community. At 1:00 p.m. you will have your lunch on Naivasha Fishermans Camp at your own expense. At 2:00 p.m., enjoy a relaxing boat ride on Lake Naivasha where you can see some of the local wildlife, which includes hippos, buffalo, fish eagles, pelicans, and much more for one hour. You will return to Nairobi at around 6:00 p.m. And that is the end of your safari tour. You will have a bike ride at Hell's Gate and a relaxing boat ride at Lake Naivasha. This safari adventure will be at Maasai Mara National Reserve, Lake Nakuru National Park, and Lake Naivasha National Park in Kenya. You will be served with daily meals as per itinerary. You can also try visiting the Masai village and experience the hot air balloon safari at an extra cost of 450 USD per person. 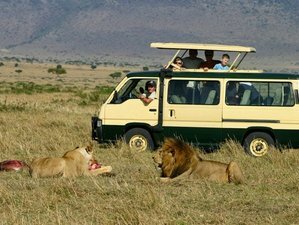 Gracepatt Ecotours Kenya offers day trips, excursions, multi-day, extended tours, camping, luxury safaris, and volunteer work in various location in Kenya.